Murphy Beds offer a lot of benefits to you as a homeowner. First and foremost, they provide an easy way to furnish small bedrooms, guest rooms, tiny homes, and other spaces with a nice, comfortable bed that doesn’t take up a lot of valuable floor space. Secondly — when you choose a Murphy Bed from Wilding Wallbeds — you get a beautifully constructed bed that is crafted from high-quality materials and designed to stand the test of time. And finally, the style you choose for your Murphy Bed can help to define or accentuate the style of the room it’s in. To take full advantage of the aesthetic qualities of your Murphy Bed, however, you need to make sure that you choose the right bedroom linens. After all, just because your Murphy Bed isn’t always on display doesn’t mean that you can’t dress it up to match the room it’s in. When choosing linens for your bed, it’s important to keep certain key factors in mind. Let’s take a look at some of those key factors and how they can influence your choice of bedroom linens. 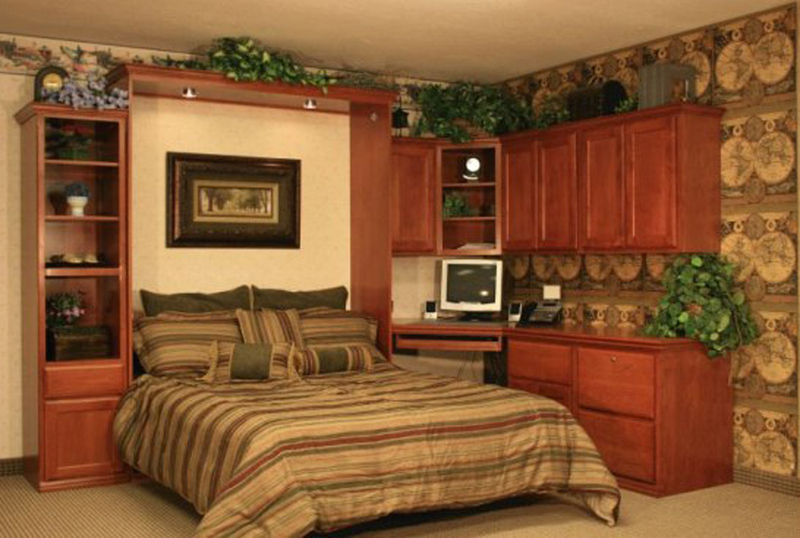 And while you’re at it, check out some of these great features of a Murphy Bed. When choosing bedroom linens for your Murphy Bed, you should begin by considering what the room’s existing decor style is (or what the decor will look like if you’re remodeling). Generally speaking, you aren’t going to want to put bold, modern linen patterns into a quaint country style bedroom or old fashioned linens into a modern room design. Then again, maybe you do. You will want your bed linens to work with the rest of the room’s decor, but that doesn’t mean it has to match it perfectly. Take some time and consider what kind of bedding is likely to either blend with your room’s decor or contrast with it in a pleasant manner. If you choose to use a contrasting bedding style, take extra care to ensure that the bedding still works with the room and doesn’t clash with the rest of the decor. You can do this by using color, texture, pattern, or other details to help tie the room together. We’re going to assume that you’ve already chosen a Murphy Bed that works well with the rest of the furniture in the room. Now, you need to make sure that the bedding matches the furniture style, too. Simple furniture can be matched with simple bedding designs to create a clean, minimalistic look. Conversely, elegant bedding can dress up furniture that is more fancy and intricate. On the other hand, you may choose to use bedding that contrasts nicely with the furniture style you’re working with. For example, you may desire to use rich, vibrant colors and chic textures to offset simple furniture. Or you could use simple, elegant bedding to contrast with intricately detailed furniture. Once again, it’s up to you to make sure that your bedding works with the room. Color choice is often one of the most important factors in choosing the right bedding for any room. You’ll want to begin by establishing a color palette for the room and work your bedding choices into your chosen color scheme. Below are five common color schemes and how they can be applied to your choice of bed linens. Single Color – A monochrome color scheme can be incredibly striking, but can also be tough to pull off well. If you choose to use bed linens that are all the same color, make sure that your chosen color works with the colors used in the rest of the room. For example, bed linens of a deep, rich blue can nicely complement a gray themed bedroom. Neutral Colors – One great thing about bed linens in neutral colors is that they can work with any color scheme. If you aren’t sure what kind of color scheme you’ll be using in a room or if you will be changing the room’s decor soon, a neutral color scheme is a great, safe bed. You can work with a variety of tans, grays, creme, black, and white to create a beautiful set of bed linens that work with any decor. Accented Neutrals – If neutrals feel too boring for your taste but you’re unsure about using lots of color, you can create a striking look by accenting neutral bed linens with one or two bold, strong colors. For example, you could couple jewel-tone throw pillows with cream bedding to create a nice focal point in the room. Complementary Colors – Complementary colors are situated opposite of each other on the color wheel: red and green, blue and orange, and purple and yellow. If you want to make use of complementary colors, you’ll typically want to do one of two things. You can match the tones of the two colors — both bright, both pastel, both dark — or you can mix the tones. One beautiful combination of mixed tone complementary colors is a deep navy blue with a pretty pastel orange. Patterns can be a fun way to introduce visual interest in your bed linens. The trick is to find patterns that work well with each other and with the room’s decor. Take care to choose the right patterns for you. You can use strong, bold patterns that draw attention to themselves or simple, small patterns that are less obtrusive. Either way, you can create a truly unique look when you choose patterns that complement each other but don’t actually match. Texture is another way to bring extra interest factors into a room. Here are some options you can use to bring texture into your bed linens. No matter what choices you make in your bed linens, remember that it all comes down to personal taste. Your style is unique to you, and you’re the one who will have to live with the bed linens you pick. The above suggestions should be seen as a starting point so that you can get your creative juices flowing. Once you’ve made decisions on what type of bedding you want, you should try to have at least three sets of bedding for each bed in your home. This allows you to have one on the bed, one in the linen closet, and one in the laundry when necessary. It also allows you to rotate cooler summer sheets with warmer winter sheets without difficulty. And don’t forget: rotating and cleaning your sheets regularly can help them to last longer. Now, get out there and choose the perfect bed linens for your new Murphy Bed!